Formative assessment is the process that uses informal strategies to allow teachers to regularly gather information about the ongoing progress of their students, and then they can adjust their instruction, target students’ specific problem areas and intervene at earlier stages to solve them (Moersch, 2008). One of the instruments suggested by Brookfield the author of “The Skillful Teacher: On Technique, Trust, and Responsiveness in the classroom” is the learning audit which is an instrument that assesses and tracks students’ accumulative progress in a particular course. The students are asked weekly to respond to three questions “What do I know now and I didn’t know this time last week?”, “What can I do now that I couldn’t do this time last week?”, “What could I teach others to know or do that I couldn’t teach them last week?” (Brookfield, p.29, 2015). The instrument was originated to address one of the most common and frequent students’ complaint that they are “learning nothing, making no progress, getting nowhere” (Brookfield, 2015, p.29). When I examined the instrument closely, I found the three verbs “know”, “do”, and “teach” used in questions of the learning audit instrument represent the different forms of students’ learning. And thus, learning audit is considered to be a precise instrument that can give an accurate guide for instructors to gauge students’ progress and help students to know where they stand .The instrument is a formative assessment for learning and not of learning in which besides using the information gathered to assess students’ understanding, it simultaneously helps them gain knowledge and practice skills (EduGains, 2010). It is also a self-tracking instrument where students articulate what they learned on weekly basis as well as at what mastery level they have attained the content. As they review their past work it would enable them to track how much more complex their current work than their previous one. The instrument could help them to take ownership of their own learning and increase their intrinsic motivation. As I experimented the instrument, I found it helpful in resolving one common issue in a beginner level programming course where students are required to understand a variety of different areas in programming such as logic and mathematical concepts, and solve frequent small scale exercises in their lab sessions. But students’ expectations are quite different, the majority of them expect that they would be implementing their own mobile apps and games from day one. At this point some of them complain in their feedbacks that they are not learning much, I used to discuss the issue to fix things and get the course back to track, but I found the learning audit is a more effective tool than oral conversations as it represents students’ documentary on what and how they are learning the course material. Learning audit helped my students to gauge their own learning progress and outcome, and gave me a feedback of what students understand, know and can do as well as what remains confused or uncertain. 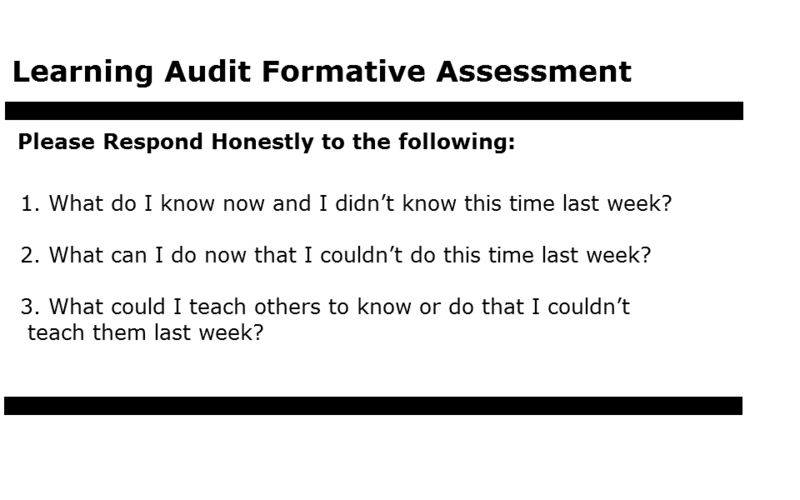 Perhaps what I found the most challenging point about using the instrument was how to sell students the value of responding honestly and accurately to the questions of the audit. Yet it is possible when I act responsive to students’ answers and they can feel that I made adjustments to enhance their learning experiences. This entry was posted in Evaluation of Learning on May 2, 2017 by Marwa Kotb.